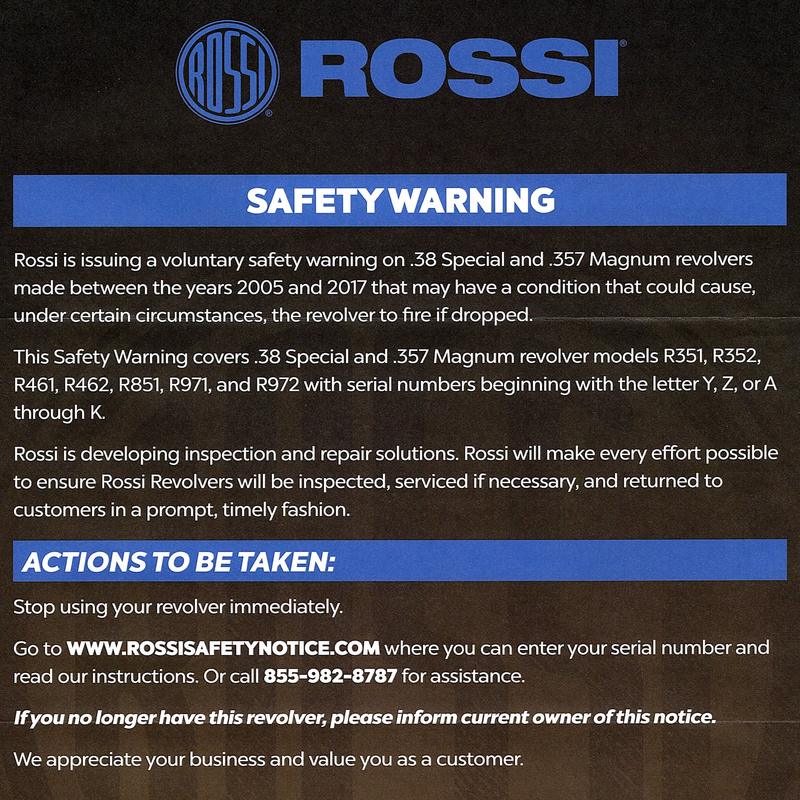 THIS SAFETY BULLETIN DOES NOT APPLY TO RUGER PRECISION RIFLES WITH POLYMER BOLT SHROUDS. Ruger Precision Rifles (regardless of caliber) that have an aluminum bolt shroud and fall within the following serial number ranges are potentially affected: 1800-26274 to 1800-78345 or 1801-00506 to 1801-30461. For more information regarding this safety bulletin, visit Ruger’s website ⇒. Visit www.danieldefense.com/Safety ⇒ for additional information. Ruger recently discovered that all Mark IV pistols (including 22/45 models) manufactured prior to June 1, 2017 have the potential to discharge unintentionally if the safety is not utilized correctly. In particular, if the trigger is pulled while the safety lever is midway between the “safe” and “fire” positions (that is, the safety is not fully engaged or fully disengaged), then the pistol may not fire when the trigger is pulled. However, if the trigger is released and the safety lever is then moved from the mid position to the “fire” position, the pistol may fire at that time. Until your Mark IV pistol has been retrofitted or you verify that it is not subject to the recall, we strongly recommend that you not use your pistol. Visit Ruger.com/MarkIVRecall ⇒ for additional information. Winchester Repeating Arms has discovered that a limited number of SXP (3½” chamber) shotguns (also called the Super X Pump) may, under certain circumstances, unintentionally discharge while closing the action. Failure to return any affected shotguns for inspection and/or repair may create a risk of harm, including serious personal injury or death. SXP WATERFOWL HUNTER 3½" 12 26" or 28"
SXP BLACK SHADOW 3½" 12 26" or 28"
SXP TURKEY HUNTER 3½" 12 24"
SXP LONG BEARD 3½" 12 24"
The original notice can be found on the Winchester website ⇒. Although this notice has been out for awhile, I wanted to get it posted here for those clients who might not have seen it yet. Remington Arms Company, LLC (“Remington”) is voluntarily recalling Remington Model 700™ and Model Seven™ rifles which were manufactured from May 1, 2006 through April 9, 2014 and which have an X-Mark Pro® (“XMP®”) trigger. Rifles manufactured after April 9, 2014 are not subject to recall. To get more information visit the recall page ⇒ on the Remington.com ⇒ website.